As I have argued, there is a strong tax policy case for taxing the net investment incomes of all charitable endowments including donor-advised funds, community foundations, all educational endowments, and foundations supporting hospitals, museums, and other eleemosynary institutions. Like corporations and private foundations that currently pay revenue-generating income taxes, charitable endowments use public services and have capacity to pay tax. Such traditional tax policy criteria including equity and economic neutrality counsel that similar entities and persons should be taxed similarly. Just as corporations and private foundations pay income taxes to support federally-provided social overhead, by analogy, all charitable endowments, as similar entities, should pay similar taxes as well. Section 4968 falls short of the goal of a comprehensive, revenue-generating tax on the universe of charitable endowments. Section 4968 is poorly designed to boot. Most anomalously, Section 4968 taxes some relatively small educational endowments while leaving other, much larger endowments untaxed. Section 4968 is best defended in political terms as an incremental step towards the kind of comprehensive tax on all charitable endowments suggested by conventional tax policy criteria. In sum, the problem is not that Section 4968 goes too far but that it does not go far enough. For all relevant purposes, the charitable endowments not taxed today are similar to those that are taxed. By analogy, these currently untaxed endowments should also be taxed on their net investment incomes as these endowments use the same public services and have the same capacity to pay as the corporations, private foundations, and college and university endowments, which today are taxed. In the final analysis, a tax on some or all charitable endowments raises the fundamental, politically-charged question which lies at the heart of most tax policy debates: Who should pay for public services? As long as the US levies a conventional corporate income tax and imposes revenue-raising taxes on private foundations, traditional tax policy criteria such as ability to pay, benefits received, economic neutrality, equity, revenue-generation, and administrability justify broad-based taxation of all charitable endowments. All such endowments utilize public services and have capacity to pay tax. Section 4968 does not create such a broad-based endowment tax. It should be the harbinger of one. Featured image credit: Yale university landscape by 12019. Public domain via Pixabay. Edward A. Zelinsky is the Morris and Annie Trachman Professor of Law at the Benjamin N. Cardozo School of Law of Yeshiva University. 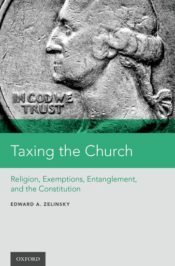 He is the author of Taxing the Church: Religion, Exemptions, Entanglement, and the Constitution. His monthly column appears on the OUPblog.